Chef Douglas Keane earns the title of Top Chef Master in the season 5 finale: Something old, something new, something borrowed, something sous. Photo courtesy of Bravo TV. For "something new" Douglas serves a perfect reflection of the time he's spent in Japan and how that lives in his food today: up soba wrapped ocean trout with ginger dashi and groats. With the third course – something borrowed – viewers learn that it was judge Ruth Reichel's review of Chef Gary Kunz that inspired Keane to dine at Kunz's Lespinasse, only to become so enchanted with his inventive use of ingredients that Douglas had to go to work for him to learn. It's "something sous" for dessert and Chef Keane reinvents Paul's panna cotta, the judges' least favorite dish from the Sous Chef Challenge, into a black sesame version with shattered miso custard and green tea matcha. While its grey color surprises, the striking flavor combination and 'abstract unobtrusive beauty' leaves the judges wanting to eat food like this more often. Then they name him Top Chef Master. In the words of the judges: "There is such a maturity and confidence to how Douglas was cooking tonight. Every bite had purpose. It's quite extraordinary to think of the road he took us down... A couple of those dishes we had tonight, I couldn't imagine them being any better." Chef Sang is back to judge the burger Quickfire Challenge, to Sang's delight and the dismay of the other chefs, especially Douglas who tried to trip Sang up with a ketchup challenge in last week's episode. "Satan has just walked in to judge my burger..." but it's the quality of the inventive shrimp burger that makes Douglas' dish the least favorite (and he agrees). The Elimination Challenge is an emotional one as the chefs create a dish inspired by one of four remarkable teachers from the LA Unified School District. Douglas is inspired by a fairy-tale wedding that his honoree, Emily Grush, a special education home-health school teacher, shaped as a lesson for one of her students. Served up with roses for Emily and her student Camille, Douglas' luxurious smoked salmon with cauliflower, cucumber, and three kinds of caviar earns him his place in the finale, although Chef Bryan takes the win for the day. "Service starts and I feel really blessed. I get to honor Emily with this dish. Her story was amazingly inspiring. She helped (Camille) learn and heal. I wanted to create a dish that would be served at the fairytale wedding that she helped plan. (To Emily) The love that you feel between you and your students is obvious and this dish should symbolize that for you." Mexican wrestling variety show, Lucha Vavoom, and "Lemony Snicket" combine for the strangest episode yet. Sous chef Paul wins his battle, giving Douglas a unique advantage. Douglas gets to determine the Quickfire Challenge for himself and the rest of the chefs. His choice to get Sang with a ketchup challenge backfires when Sang ends up in the top three and Douglas in the bottom. Chef Keane still has immunity though, and clearly a good time, as he dishes up "Bloody Marias" and chorizo and corn fritters with scallion and garlic aioli ringside for 300 guests of Lucha Vavoom. Chef Keane's dish is not a judges' favorite, but it's Chef Sang who has to pack his knives and go. "That's my sous chef! I'm proud of Paul. I hire good people. Drew covered my (behind) from the beginning and now Paul is doing the same." Chef Keane wins another Quickfire Challenge, this time deconstructing nachos for Ali Larter into chipotle-lime-glazed shrimp with powdered nacho chips, cheese, beans, and a salsa consommé, earning another $5,000 for Green Dog Rescue and immunity for himself. In the Elimination Challenge, Douglas pairs up with Chef Jen Jasinski. They get first pick from Malibu's catch of the day and also decide to offer their cold and hot treatments of the John Dory as one cohesive dish. Their resulting kimchi-cured John Dory with crispy John Dory and cucumbers wins the challenge, netting yet another $5,000 for Green Dog. The camaraderie and the challenges of the Top Chef Masters are evident this week, as they shop, chop, plate, tell stories, and even get to relax together over dinner. Among other moments, Neil and Sang both razz Doug over his seemingly ever-present konbu (though Sang actually uses it in his dish, and gives Douglas credit). Douglas also talks about the brain tumor he conquered ten years ago, how it keeps him from being able to run during the challenges, and requires him to work smarter. "Sang and I are sharing a brain, and he has it right now." "My first date with my wife I prepared a huge picnic for her. It was a big fight to get her up the hill, but when she saw it, she was surprised. It was a great date." 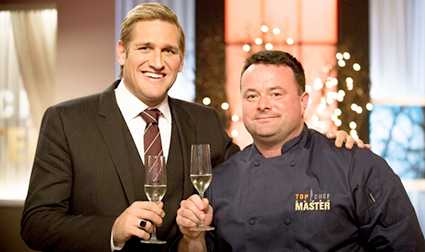 Top Chef Masters gives Douglas, known for Michelin star-rated Cyrus in Sonoma County, CA, a chance to highlight his other passion – dog rescue. Keane combines his mastery of the ingredient world, cool-under-pressure style, and inventive approach to raise money for Green Dog Rescue, a non-profit he co-founded to help dogs thrive by socializing them in a pack, their natural social structure. His experienced sous-chefs, Drew Glassell and Paul Winberry, also help the cause in the weekly online Battle of the Sous Chefs that provides the Top Chefs with advantages or sometimes disadvantages. Visit Bravo's Episode Guide for more behind-the-scenes photo, videos, and commentary, including this Bravo TV Q&A with Chef Doug where he updates everyone on his romance with Sang.